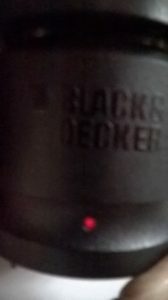 My friend Buddy gave me a Black and Decker 12v drill, battery and charger. The drill worked but ran slowly due to a battery that needed charging or replacing. 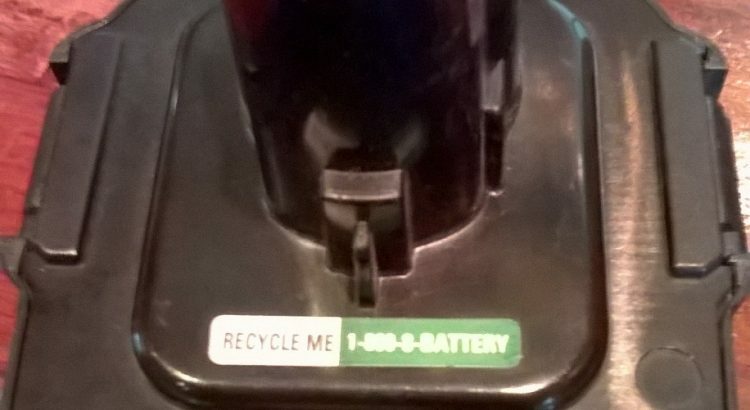 The battery had a label with a clear message “RECYCLE ME 1-800-8-BATTERY” yet it was disposed in the regular trash. It is no wonder we are only recycling 15 percent of plastic bags and trash in the US. Here are the steps I took, using old fashioned common sense and deductive reasoning to evaluate and charge the battery. I first checked the charger to see if it was producing current. It was not and the light did not come on. I concluded it was probably not working properly. I next decided to determine if the battery would hold a charge. I have a auto battery charger and believed that it would work. I have a working knowledge of electricity but try to proceed with caution especially in uncharted territory. I could think of no reason why not, but nevertheless searched the internet and found someone who had done so successfully. Still, erring on the side of caution, with the charger set at the lower amp setting and the charger a safe distance away from the extension cord plug in and my location, I charged the battery for 10-15 minutes. The test was successful and the battery worked with the drill. I next decided to repair the charger. The rectangular plug in part has the transformer (120v AC to 14v DC). I found an old laptop computer charger with 12v output (waste not want not) and connected it to the charging stand. The red light now comes on and it appears to be charging. The meaning of the red light is still a little mysterious. I finally found a manual and it is practically useless. Of course, when the battery fails, it will be disposed of properly.